It doesn’t happen often, but I have just rendered my daughter speechless. Not that she’s particularly loquacious, but she will speak her mind as necessary. And pass honest judgement on her old Mum’s cooking. More particularly my modest attempts at baking. Ouch. When my Rachel was young I would make a good effort at donning a ‘pinny’ and doing a spot of after-school baking with her. But even then it was mostly breadsticks, flatbreads, or making something for a bake sale: we would lick the spoon and tidy the edges of course. As most of you are aware I am much more attuned to savoury foods than sweet. This is a particular handicap that translates itself into a general lack of enthusiasm for baking cakes and cookies. I do get a hankering for sweet things, but when it hits it is sudden – perhaps hormonal? – and readily assuaged with a hefty snap of dark chocolate, or even a fat Medjool date (sad to admit). Mostly I crave the salty and the crisp. It could be seeded flatbreads, kale chips, popcorn – even plain tortilla chips (always bought; usually the cheapo supermarket-own ones. I know. I know.). But of course I am not a complete weirdo. I appreciate good home baking. Just yesterday I was tempted by the freshly baked-on-the-premises cakes at the fab Whitmuir The Organic Place cafe, but time and a full stomach nixed me getting a slice. So, I am not averse to cake. And more importantly, as a good American – albeit an ex-pat one – I can’t say no to a good brownie. My favourite ‘normal’ brownie is this one, but minus the mint. It is beautifully chewy and deeply chocolatey, even though it is made with cocoa and not chocolate. 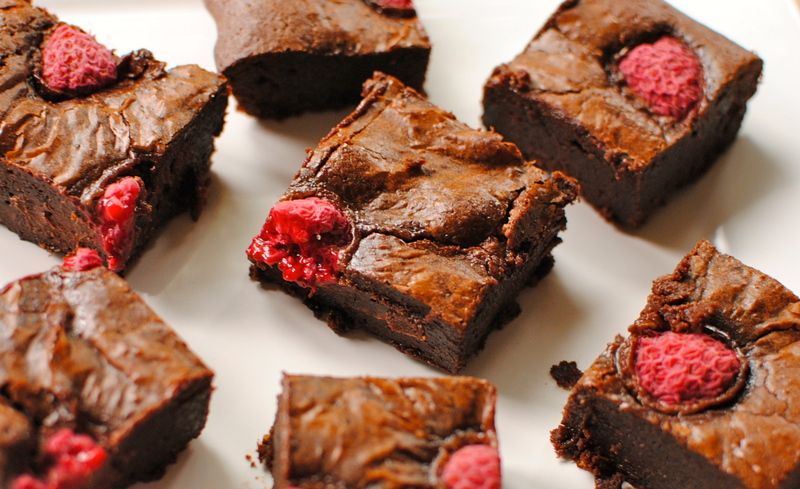 And this gluten-free flour brownie, studded with raspberries, is pretty awesome too. Many of you will already be well aware of the black bean brownie and of its many iterations. I don’t know about you, but a number of the recipes I have road-tested over the years haven’t been that great. It may have been my interpretation or liberal way with a timer, but still. Normally I will give up on a baking recipe if it doesn’t please me – us – but I knew that with just a little tinkering around I might be able to crack it. Or rather, softly pull it apart. Cracking is not what you want in a brownie! I am not sure who first came up with the idea of subbing flour for beans but I would like to shake their hand. They are a genius. I just hope you like my little spin. Before I give give you the recipe, a few side notes. Some of the photos were taken in the summer when raspberries were in season (yes, I have been keeping this from you for that long!). We love berries with chocolate so if you have some good ones available I can heartily recommend popping some on top as a a perky garnish, or even pushed into the brownies just as the pan emerges from the oven (like I do with my lemon polenta cake and the gluten-free flour brownies). Today I made this up using Aduki/Adzuki beans, those little reddish almost sweet beans used in Japanese and Chinese cooking (as in red bean paste). Today’s images are the rather funky ones made on my phone. I wasn’t planning on using them here on the blog so they are all rather messy in their presentation, but I don’t think you’ll mind. Gooey brownies can’t be tamed anyway. 🙂 My other tweaks today were that I lessened the fat a smidge and subbed in some peanut butter; I also decreased the sugar and used some decadent caramel milk chocolate drops (Silver Spoon, if you are interested). The latter is what rendered my most honest critic speechless: the shop bought add-in. Oh the shame. And I have to admit I too liked the goo. So, in light of this I give tips for both the healthy-ish version and the wannabe healthy version. Your choice! Grain-free but not taste-free! I use the peanut butter more as a fat replacement and to aid the texture than for its taste, but do add more for a proper nutty taste, or use all oil. Although black beans are more common in recipes like this, aduki (or adzuki) beans are actually sweeter and perhaps better. I prefer them. 2. Pop everything but the chocolate chips into the bowl of a food processor and blend until smooth. Scrape down the sides as necessary. Remove the blade and fold the chocolate chips in with a spatula, if using. The batter will seem impossibly liquid. Really rather alarmingly so. Don’t worry. All comes right in the baking. I promise. 4. Bake 12 minutes for muffin-sized brownies, and about 20 minutes for the square tin. Bake a little longer for firmer, cakier brownies, but as written they firm up on cooling. Still fudgy though, especailly if you add something like the caramel drops. Anyway, let the brownies cool on a wire rack in their tin for about 10 minutes before popping out the brownie muffins or pulling up and out by the parchment paper. Makes 12-16 small brownies or 9-10 muffins. Eat warm from the oven, or store in the refrigerator. Pop in the oven or microwave to warm. 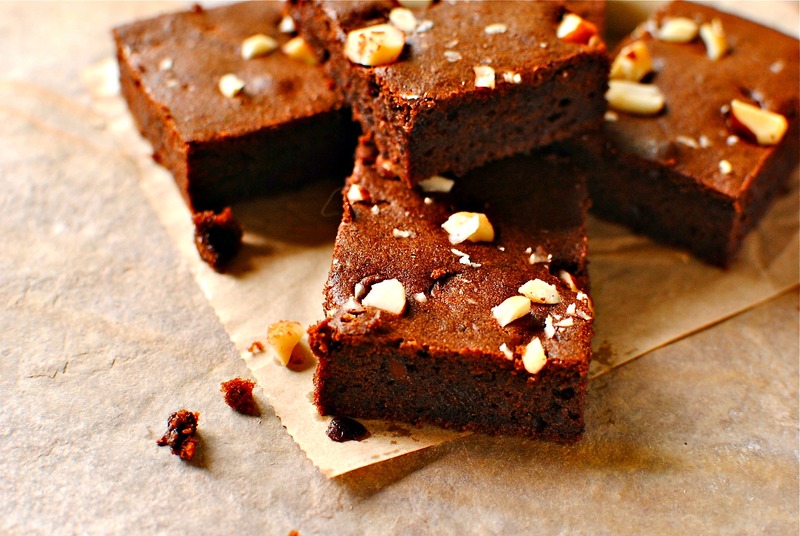 This looks like an awesome substitute for the sugar and white flour bad-for-me brownies. I want to make them with the coconut sugar a dates. Then I want to freeze them individually to have when a craving hits. Mmmm. Good. Do!! Any recipe you already use may be ripe for a beamy sub. I would love to know if you try something like this, Elaine. I only wish I could see your reaction 😉 Maybe a selfie??!! Cool! ! I will try! ! Oh my gosh. I was just thinking of working on a recipe for bean-based fudge brownies! Now, I don’t think I’ll have to. Yours look very stream-lined and uncomplicated, just like I would want it. Will definitely be trying this, thanks Kellie! These turned out great, thanks for the inspiration Kellie! I made some substitutions as I mentioned I was already starting to write up my own version. Subbed cannelini beans, 1/2 avocado for the peanut butter/oil + 2 Tbsp applesauce. And I used all dates. In the end I would have liked them a little firmer, in other words still fudgy but with structure if that makes sense! .I can tell yours were set in the right way but still fudgy. Baked for 20 in convection, maybe needed 25. Do you think too many dates and omitting sugar could do this, or maybe no need for the applesauce next time? I like the fudge pudding idea, good one!! Thanks for the suggestions. I agree no applesauce next time and a lower, slower bake time should work. Thanks Kellie! Yum, Kellie… you always come up with the most interesting recipes! Wow, Kellie! You know, I’ve been very anti bean brownie without ever having actually tried them. It’s something about sneaking the beans in and faking a treat as a ‘healthy’ version – you know my nutrition logic well. But these ones look so actually good and gooey you’ve got me wanting to run out and buy some adzuki beans asap! I will definitely try and let you know how they go. I know what you mean, Katie. But I think these stand on their own merit. We really like them even though we know what is in them! They seem to go down well in my nutrition groups too, although I don’t make them for these groups that often as beans usually feature in the main. We can’t have too many beans at once! Do let me know if you make them and how you did it. When you have the time, that is! Good luck with the final push with your thesis 😀 Almost there! Aduki beans really rock in this recipe. Incredibly versatile and undersung. such a clever idea. The texture of the brownie looks so soft and fudgy. I love that this is grain free Kellie. Great recipe. Gosh, lentils – that IS creative :D. Not encountered any recipes using lentils. I have done ones with kale and with sweet potatoes (not in the same recipe, I should add) – sweet potato ones are pretty good but need help in the texture department, imo. I can heartily recommend using aduki beans. The natural sweetness and the protein-fibre balance seems to really work in this kind of batter. But I would LOVE to hear of a lentil version. Cool beans. So to speak. PS Hope it is cooling down for you and Serendipity Farm. Thanks for introducing me to the graceful kitchen. She’s fab! I read the whole thing about body image and she is so down to earth. The recipe is amazing too. I recently did my chocolate beetroot cake with all dates instead of any added sugar. I’m so glad I did. I was really concerned that the texture would be affected but it was fine. More than fine. And she does the all date thing too. Perfect for fudge texture. Again, thanks, Fran. Haven’t looked at the Russian one yet. These look heavenly! Funny how in my household, I (the daughter) am the one with the innovative cooking. You’re cooking always gives me new ideas, and always looks delicious! OMG! 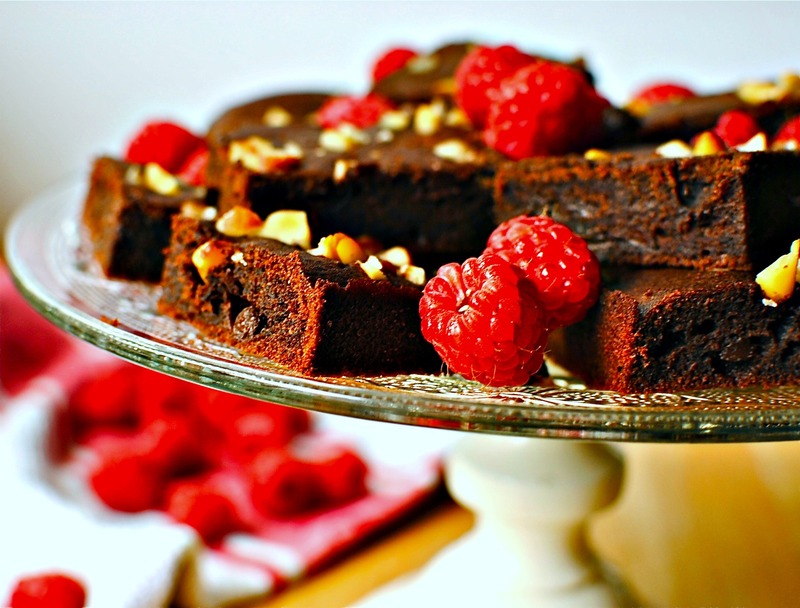 These brownies look amazing and what a fabulous idea to use beans! Will being baking these beauties with my girl Luna at some point this week! Thanks for the great recipe! I hope you and Luna (what a beautiful, romantic name) enjoy them very much! Mmm yum! 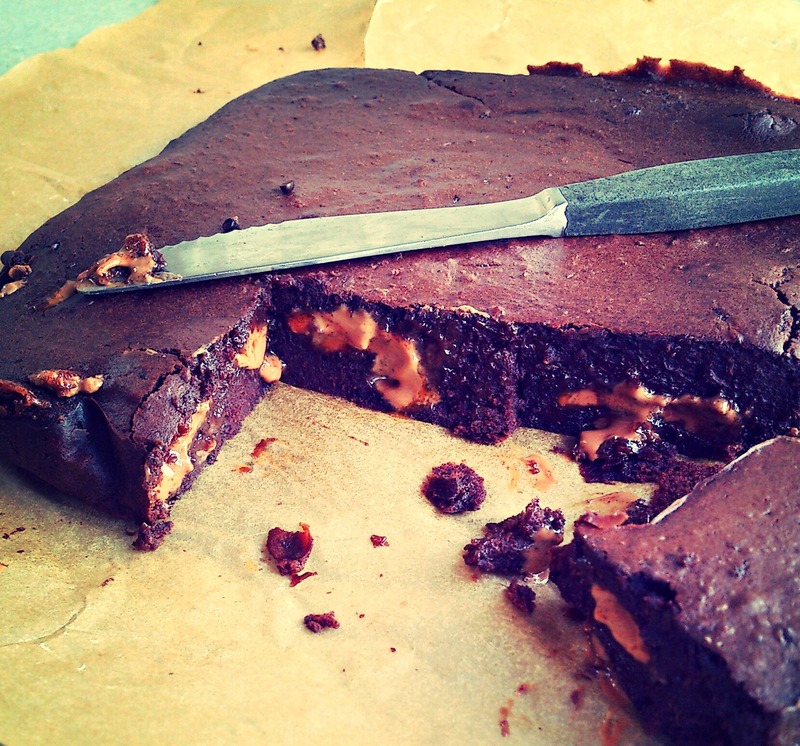 I’ve only just recently discovered the wonderful world of bean brownies (I just blogged a black bean one myself!) but yours look so much lovelier with their gooey centres. Hi Elizabeth! 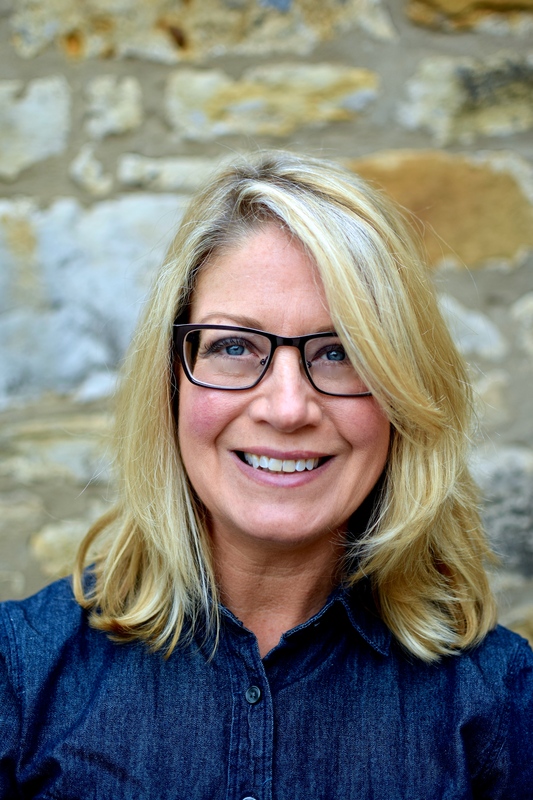 Great to hear from you (readers: she has a stupendous blog – droolworthy). The goo is from a cheaty addition of caramel drops, but hey ho, they were dead tasty. I will check out your version soon. Thanks so much for stopping by and commenting. These look sublime! How can you take such good shots on your phone, you are a seriously clever lady. Thanks also for introducing me to the Whitmuir Organic Place – we rarely go South of Edinburgh (normally North & East) so I think we need an investigation towards the borders, thank you! They look incredible! Will definately give them a try- and I have never heard of the beans substitute before- brilliant! Thankyou! I’ve used black beans with good results but now really want to try your recipe with aduki beans, especially as you’ve managed to make them properly fudgy. The peanut butter sounds rather good too. Oh,the aduki beans are really good. Please trying swapping them in with your own tried and true recipe and let me know if you spot the difference. The gooeyness in mine is down to the ‘naughty’ addition, but I think the timing I have suggested and the dates and peanut butter did help with the fudginess. With your blog handle I expect you are quite the chocolate expert so I will defer to you! LOL! I have seen and commented, Miss EA. What are we like? I think we need to check our birth certificates and see if we are related? Me being massively older of course ;-). What a great idea, love the idea of subbing black beans for flour. They look gorgeous! Isn’t nice to be able to incorporate healthy foods into indulgent treats?! What a wonderful batch of brownies which I know will taste as good as they look. I do think you should carry on with the sweet bakes if they are going to be as good as this and as interesting! Aw, thanks Laura. But I can’t hope to ‘compete’ (if you know what I mean) with all of you proper bakers. I really don’t do it enough to pass muster really. I am glad you like these though. They do seem to work somehow. 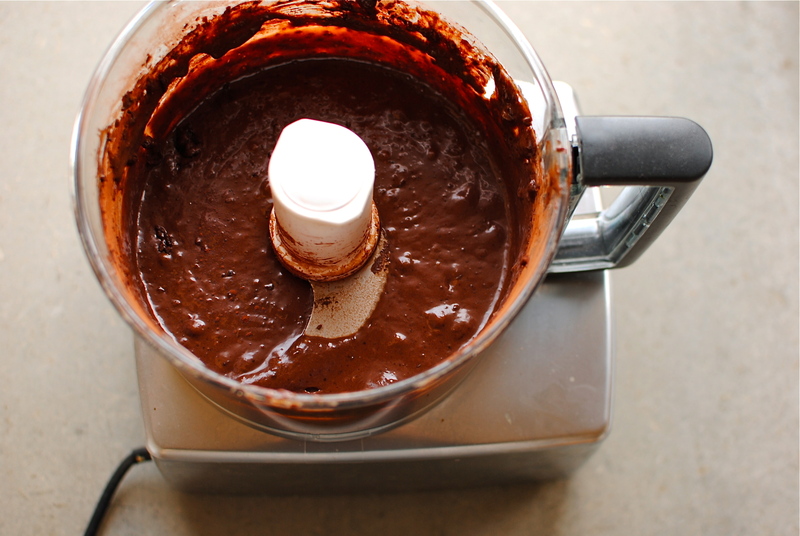 I also have a black bean chocolate frosting on the blog. But that would definitely be overkill. Probs one of the chocolate-avocado frostings would be amazing. Ummmmm yummy. My hubby loves brownies. I’ve tried another type of brownies before using black beans, but my daughter didn’t like them. This one looks so much better. Gonna give it a try and try it out on my family. 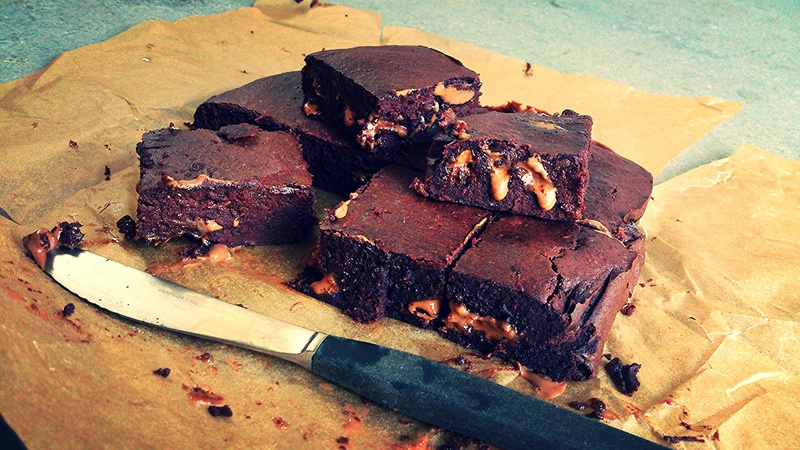 Wow, these looks so gooey and delicious! I love that you provide vegan options for a lot of your recipes – I’m having a lot of fun perusing! Thank you for the interesting recip! my turned out a bit too gooey. I used currants instead of dates but kept to the recipe otherwise. I used chia seed eggs (2 eggs worth). Any thoughts as to why this would happen? They taste really good but it is way too gooey for public presentation. Hmm, just wondering if the beans were a but too wet? I’ve not had this problem but maybe also it could be oven temperature. My oven runs hot and I always have to adjust so things don’t dry out . Sorry about that, but glad you like the taste anyway. Maybe if you make them again do it for a bit longer, maybe covering until the last 10 minutes to ensure even heating. I’m making these for a couple of nutrition groups this week so I will pay close attention and report any enlightening findings. Wondering if the chia eggs were too ‘large’ Maybe try slightly less water. Chia eggs are usually 3:1 water to seeds but if seeds aren’t as absorbent as usual, or not been soaked first, then the water is ‘free’. This may be the issue. Hope this doesn’t sound too bossy! thank you for your quick reply! You may be right, the chia eggs actually seemed too dry so I added a little more water. I’ll try again! Hello and best wishes from Belgium. I tried the brownies today, as I had a tin of Adzuki Beans that I planned to use for filling japanese sweets. But now I saw this recipe and I tried it right away. I added a little flour (50g) and took 80g sugar instead. I added Walnuts to the pastry as well and I have to say: They are delicious! Thanks for the lovely feedback, Sandra! I made the azuki brownies today, and as scepticle I was, I must agree they are great!! Thanks for the lovely feedback. I’m so glad they turned out for you. We make them quite a lot. I haven’t made “regular” brownies in years!